Our city in central Tennessee has become the latest battleground in the struggle against Islamophobia. A short time ago, an area that had been zoned for a church right outside the city limits of Murfreesboro (home to Middle Tennessee State University, Tennessee’s largest undergraduate university) was acquired by the Islamic Center of Murfreesboro in order to construct a larger community center complete with a space for worship as well as athletic facilities. If constructed, the enlarged Islamic Center—including a very small mosque—would be the first large facility to serve the Muslim population in the surrounding area (the current Islamic Center is incredibly small and located in the industrial sector of the city near the interstate). Following all the legal procedures, the Regional Planning Commission approved the construction—just as it would any of the roughly 180 churches in this area. That was when elements of the far right, organized by the extremely well-funded mega-church World Outreach swung into action, stacking a Rutherford County Commission meeting with vocal footsoldiers. After that, the local newspaper announced that a march against the mosque had been planned for July 14th. That was when the local Solidarity branch began its work. The Middle Tennessee branch of Solidarity began gathering like-minded folks in the community together to form an ad-hoc grassroots group to organized a counter-protest. 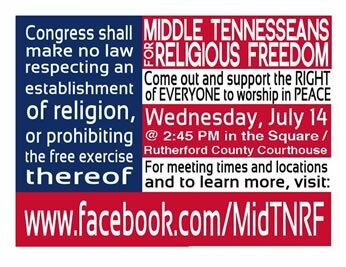 It was decided to name the group Middle Tennesseans For Religious Freedom and a meeting was held last Wednesday. It was attended by over 20 individuals who were committed to helping organizing the event (with 3 or 4 Solidarity members present rather than the whole branch), including a documentary film maker from out of town (another 10 or so are involved in organizing in one form or another but could not attend). It was agreed at the meeting to have the entire counter-rally themed around protecting the constitutional rights of all Americans rather than positioning the event as a defense of Islam per se (this was also the desire of the Islamic Center representatives). That said, we all have prepared ourselves to respond to the lies about Islam that are being spread in this struggle. Since then our struggle has appeared on national news coverage, including Jon Stewart’s Daily Show—though our grassroots network was only a day old at the time. We have been phone-banking, going door to door, canvassing neighborhoods and local businesses and much more. Islamophobia conflates ethnic, religious, cultural, and national identities into one figure which stands in a place not unlike “the Jew” in traditional European antisemitism. The power of this image of the subversive Muslim is drawn from the effect of ceaseless imperial propaganda displayed in the corporate media. It has the power to mobilize the oppressed and exploited populations of the great capitalist powers via the projection of irrational fantasies of imminent Islamic revolution onto an incredibly small minority population. Without a strong anti-war movement working deeply with the Muslim community, the mainstream population has been subjected to endless scapegoat ideology without any serious counter-force. On July 14th, with nothing but grassroots organization, we will confront a march organized by the shadowy forces of the local Republican Party apparatus and the corporate-funded World Outreach Church. We ask for your solidarity and support. At this time, the County has made its decision, and we are simply supporting it. If this counter-rally goes badly and they reverse their decision, we will reassess the situation and the struggle will continue. Terms ending in the suffix ‘phobia’ are not only of psychological origin. It can also mean hatred, as well as fear. The use of the suffix to denote bigotry against certain groups goes back to at least the mid-nineteenth century, well before psychology became institutionalized. The first word I know of is ‘Slavophobia’ and ‘Slavophobic’. You can use ‘phobia’ with almost every individual Eastern European ethnic group. These terms date back to the period of Austro-Hungarian colonialism. ‘Phobia’ is used in other non-psychological ways, such as the term ‘technophobic’. I don’t mean to single you out; both terms are very widespread and used so un-reflectively by most on the left. There needs to be a counter-trend. Otherwise, an excellent report on a struggle in an area with little left presence. You comrades in the Middle Tennessee branch of Solidarity are heroes. Thank you for standing up for the religious freedom of all individuals, whether we agree with their religious beliefs or not. I used to live in east Tennessee, Knoxville, and oftentimes there was no clear separation between church and state. Many Christians were almost terroristic in their belief that their faith was the only one true path to God. It was truly frightening. Whether Mr. “Anonymous” wants to admit it or not, the World Outreach Church was probably very much behind the smear campaign to stop the Islamic Center from building a larger community center. Often megachurches like this try to control the whole community and eliminate any force that is not Christian. You comrades are doing great work! Keep it up and don’t let Christian fascists stand in your way! Oh this is so cool! You guys from Solidarity rock. Keep up the fight against racism and Islamophobia. I am constantly amazed at how much support progressive causes are getting all around the country. Good luck to you. Hey there. World Outreach Church certainly did organize this, but unofficially. It is well known around town and absolutely not disputed by either side. The pastor of World Outreach has a famous quotation from the first event, when they were stacking government building with hundreds of footsoldiers. Today, in the streets however, the grassroots prevailed over the funding and hierarchy of the right wing forces behind this effort. Our counter-rally was larger than their actual rally, and they looked marginalized and ridiculous. When they sang “Amazing Grace,” we responded with the Star Spangled Banner, presenting a united front in defense of democratic gains struggled for, against appeals to mythic Christian white fantasies. I will respond to all of this when I am not busy organizing this huge effort. I’m not tech savvy, I write articles, and loathe my time on the internet. That said, let me respond to just a little of this. 1) the mosque fell under COUNTY planning without CITY regulations, and therefore was MUCH easier to pass, and given that it is the ONLY mosque, versus the ever expanding DOZENS of churches that cramp this town (180 is a bit excessive, seriously drive down the street, if they weren’t non-profits they’d all be out of business in a day because the market is OVERSATURATED with churches, with only a SINGLE Islamic Center that is woefully small, tucked away in the INDUSTRIAL part of town. So yes, it went through faster, unlike World Outreach Church which was in the CITY. Also keep in mind that World Outreach Church is currently building its FOURTH complex, that is 125,000 square feet. The entire Islamic center is 52,600 after a decade of gradual building. Keep in mind it is the ONLY Islamic place of worship, whereas World Outreach is one of many megachurches. 2) Kevin Fisher is associated with World Outreach, as are the vast majority of the foot soldiers on the other side. simply ask those who came out what church they attend, they will gladly proclaim how great their church is, how great Jesus is, how great ALL religions are EXCEPT Islam. Keven Fisher is their spokesperson, and he absurdly stands in front of over 1000 people and cameras and proclaims that this has nothing to do with religion or Islam, it has to do with TRAFFIC ordinances…half of the crowd is carrying hate signs that are anti-Islamic. We are standing side by side with dozens of fellow citizens, including some GOOD friends AND COMRADES from the Islamic Center itself and they say hateful things to us and threaten the lives of our friends and their families simply because they come from Islamic cultures. Fisher then informed us (we have great footage) that in Islamic countries, we wouldn’t have this freedom, contradicting his stance that this had nothing to do with the fact that the building was Islamic. 3) A comrade here, Andy, tried to present Keven a flower as he spouted hate speech. He refused it. Andy commented later, “How repressed are they? Even in the 60′s they accepted flowers”…I think that sums up the experience here. Small-business owner John T. Butler said he attended the vigil primarily because of recent comments made by Allen Jackson, who serves as senior pastor of World Outreach Church in Murfreesboro. “Butler said he had been visiting the church recently, but he has decided not to return because of Jackson’s remarks during the past week about Muslims. During a worship service last week, Butler alleged that Jackson told the congregation that Christians are in the middle of a “war against Islam,” and church members need to prepare themselves for battle against the Muslim faith. Sounds like “promotion and leading the discussion” to me, buddy. Shame on you for stirring up dissension about a church who does so much for our community. They have done nothing to promote this march nor to lead any part of this discussion! You are printing lies and you should be ashamed of yourselves. Nothing was organized… the people came together and demanded the planning commission to follow the same guidelines for them as for everyone else – such as discussion on who is going to pay for the road to have a turning lane etc. – not true. The churches in the area have to go through traffic studies, lighting studies, sound studies, etc. New video with me on channel 4 with me in it identified falsely as Jase “Schwartz.” Our follow up meeting had 60 plus community members come out to help plan the event, though the organizers are all youth (from Solidarity, the Islamic Center–there’s an overlap on one–and from the general milieu of lefty folks here) the actual effort involves folks from every age group. Some of our branch members have done an admirable job on this thing everyone should be proud. I will post a follow up after the actual event.